This Easter people in the UK will spend around £400 million on chocolate. Every year we consume an average of 10kg of chocolate each (the weight of a heavy piece of aeroplane hand luggage) – a staggering amount that still only puts us at seventh worldwide. (Switzerland is in first place followed by Austria, Ireland, Germany, Norway and Denmark, in fact 16 of the top 20 countries are in Europe). Chocolate is not just important to business and diets in the UK; according to the Fairtrade Foundation about six million people around the world depend on cocoa farming for their livelihoods. Chocolate’s popularity means it has been a powerful tool for changing trading patterns, as one of the first and most successful fairly traded products. Chocolate is a great way into topics such as food, farming, trade and fair trade. You could also use chocolate to explore other cultures – their food and drink and its associations with religious and other festivals; to discuss issues of health and obesity; or to think about its links to social reform, stretching back a lot further than fair trade. Chocolate also has a dark side with disturbing numbers of child labourers and slaves used in the production of cocoa. A difficult but important topic, showing that slavery is not just a problem consigned to history and demonstrating to students how their purchasing power can help improve lives. Where does chocolate fit into the curriculum? Cocoa has a global history linked to early exploration, colonisation and movements for social change. The Olmecs of Mexico were the first civilisation to use cocoa beans, which grew wild in Central America, as far back as 1500BC. 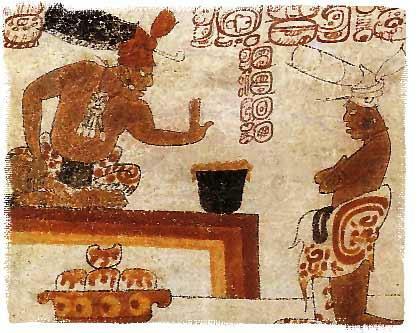 Chocolate was first ingested as a drink and the Maya are generally credited with creating the first chocolate beverage over 2,000 years ago.The Aztecs associated chocolate with Xochiquetzal, the goddess of fertility and often used chocolate as a sacred offering. Cocoa beans were first brought to Europe by the Spanish in the 16th century. In 1687 an English doctor, Sir Hans Sloane, was travelling in Jamaica where he tried chocolate. He didn’t like it much, but when he added milk to it, he thought it tasted much better. He brought his milk chocolate recipe back to England, where it was sold as a medicine. It wasn’t until the mid 19th century when taxes were reduced and transport became cheaper, that the masses could afford chocolate; before then it was the preserve of the aristocracy. Quaker chocolate companies (such as Cadbury, Fry’s and Rowntree’s) were known for their social reforms: Cadbury’s was the first firm in England to grant its workers a five-day work week and in 1893 they started to build Bournville, a model village for their workers with decent housing, schools and sporting facilities. By 1915 death rates and infant mortality in Bournville were half those of Birmingham as a whole. Chocolate is a good example of how ethical consumption can move markets. Sales of fairly traded chocolate in the UK grew from £1m in 1998 to £26.8m in 2008 and this has grown even further since Cadbury’s Dairy Milk went Fairtrade in 2009. West Africa has been the centre of world cocoa cultivation for the last 60 years and today produces 67% of the world’s cocoa. The four major cocoa producers in West Africa are Côte d’Ivoire, Ghana, Nigeria and Cameroon. Ninety percent of the world’s cocoa is grown on small family farms of 12 acres or less (according to Divine Chocolate and DFID’s Developments magazine). Fair trade is critical to help these farmers move themselves and their children out of poverty. This video clip from The Co-operative shows the process of growing and producing cocoa. Cocoa production has had both positive and negative impacts on the environment. The land required for growing cocoa plants in addition to the firewood needed in the drying process has led to serious deforestation. However, innovative solutions to pests such as intercropping and planting companion trees has provided sustainable answers for small family farms. Find out more in this sustainable agriculture case study from Global Eye (produced in 2000). The pressure to find good land for growing means some cocoa farmers illegally use national parks. Cocoa is susceptible to many insects and fungi but as the majority of cocoa farmers earn very low wages they cannot afford pesticides, which means they have had to find alternatives – many of which are environmentally friendly and help conserve forests. As cocoa is so sensitive to changes in climate, both in its requirements for plenty of water and sunshine and as a result of its vulnerability to pests, many producers are nervous about climate change. A study by the International Center for Tropical Agriculture (PDF) shows that by 2030 a large amount of the area currently used in cocoa production will no longer be viable for this crop. And if, as expected, the production of cocoa declines, the fragility of farmers’ reliance on a single crop to make a living will be revealed. This article from the Guardian (November 2014) explores different reasons for a possible ‘chocolate shortage’, covering the farmers in Ivory Coast, the processors in Indonesia, the shopkeepers in China and the chocoholics in the UK : The cocoa crisis: why the world’s stash of chocolate is melting away. A UNICEF study from 2001 reported that around 200,000 children are trafficked each year in West and Central Africa. Roughly two-thirds of the entire world’s cocoa is produced in West Africa, with 43% sourced from Côte d’Ivoire, where child labour is a common practice. It is estimated there are 200,000 child labourers in Côte d’Ivoire and 12,000 of these are slaves. Chaga and the Chocolate Factory – Story and teaching resources from Stop the Traffik about a boy in Mali who is sold into slavery on a cocoa plantation. An interesting link to the topic of population could be investigating how increases in disposable income in India and China is creating more demand for chocolate. In 2008 China and India only consumed 1% of the amount of chocolate that Europe and the US consumed. But chocolate consumption in these countries has been increasing by 15-20% annually over the past decade. This could lead to a price hike which has the potential to benefit farmers in West Africa. Alternatively it could increase the pressure on natural resources such as soil, water and forests and lead to more child labour and slavery. We got the facts and figures at the top of this page from World Atlas of Chocolate and The Business of Chocolate.